Posted on March 27, 2019 by H. W.
The book is nearly complete! It’s been a long road but I will be turning in the revised and completed manuscript to my publisher in just a few weeks. I believe I’ve mentioned it before but I have decided that my current research will be separated into two different books. The first, which hopefully will be coming out sometime around the beginning of next year, is my principal ethnography about Shaligram pilgrimage in Mustang, Nepal and about the active practice of Shaligram ritual traditions throughout South Asia. The second is going to be about Shaligram interpretive traditions. This way, I can frame the first book as an introduction to the topic of Shaligram pilgrimage for academics and laypeople who aren’t likely to have any prior background or knowledge of Shaligrams at all. The second book can then be designed more for Hindus, Buddhists, and Bonpos who already have some prior experience with and understanding of Shaligrams or who actually practice with Shaligrams right now. But as I finish up this first manuscript and get it off to the next step in the process, I’m starting to think about how I want the second manuscript to work. I already have a series of “field guide”-style pages that detail the characteristics of each of the 90 or so name-categories of Shaligram stones and I think those will be especially valuable to practitioners. But I also want to have some kind of commentary at the beginning that discusses exactly how Shaligrams are read. This is a challenge, of course, because there are several different Shaligram interpretive traditions and each tradition reads the shilas in slightly different ways. But here is a little of what I am thinking. Firstly, I want to talk about the main sets of characteristics: shape, color, set, vadana (mouth), vanamala (white thread), and chakra (spiral). Each of these characteristics exists on something of a spectrum. 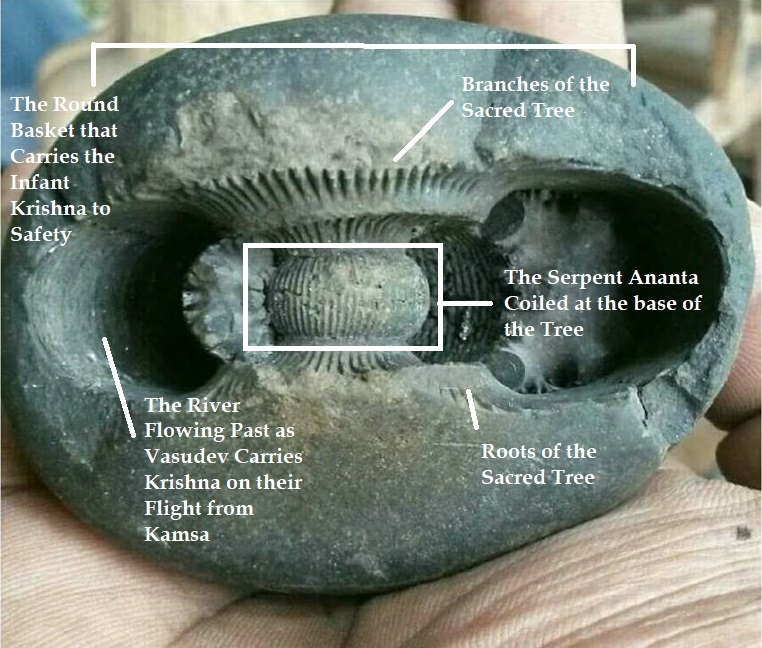 In other words, there are a variety of shapes a Shaligram might appear in, a few different colors, and it might have one or more vadanas or chakras. Or, as it may be, none at all. In any case, this makes any discussion of variations potentially limitless and I just don’t have the time or space to cover every possible permutation. Secondly, I will need to have some commentary on each of the current Shaligram traditions. There are, for example, several Vaishnava Shaligram traditions, a few Shaiva traditions, a number of Smarta traditions, as well as both Jain and Buddhist traditions. Not surprisingly, these various traditions all tend to use different combinations of sacred texts, guru lineages, and deity genealogies to interpret the specific manifestation present in the shila and, though they overlap significantly, they are each unique and distinct. I’ve compiled a table of my data and descriptions, but I am note entirely sure what I want to do with it just yet. And lastly, I want to both acknowledge and pay homage to the Shaligram books that have come before me. The two main ones being, of course, Rao’s Shaligram Kosha and Ram Charan Sharma’s Shaligram Puran (I discuss pilgrimage literature in the ethnography). Both of these works, though extremely difficult to find outside of India, have been instrumental in my research and deserve the best citations I can give them. They also aptly demonstrate some of the challenges of working with Shaligram traditions as they move outwards from the Himalayas. As Sharma’s work shows, for example, several Shaligram traditions have begun to incorporate other sacred stones, such as Dwaraka shilas and Shiva Lingams, and ritual objects, such as murti and coins, in place of rarer Shaligrams that have been otherwise too difficult to obtain. This means that any given Shaligram puja might incorporate a wide variety of mantras, images, objects, or other accoutrements whose relationships to one another might not be immediately apparent. Ultimately, as I continue to contemplate how best to move forward, I have been experimenting with a few ways to demonstrate “reading Shaligrams.” One, represented by the image below, takes a diagrammatical approach to mapping out specific characteristics and their meanings. I’m also considering using other combinations of tables, images, scans, and drawings to highlight the important processes in the most understandable way I can. Hopefully, either later this year or next year, I’ll have the chance to devote a significant amount of time to it and to the complementary online database I’ve been contemplating for a while now. Reading Shaligrams is a challenge. Both in terms of reading about them and reading the shilas themselves. So, it’s going to be a delicate balance. I’ve already included as many Vedic, Puranic, Shastric, and Tantric references as I can and I will continue to document the various ways in which both sacred texts and peoples over time have come to understand Shaligrams and to receive darsan of the deities present. But in the end, I know that I can’t include everything. It’s a start, though.